I have officially decided to cancel the 1st of January as my ‘New year resolution day’. After christmas rush I needed time to myself, so I could relaxed without worry about anything. Once I cleared up my mind and recharged my batteries, is time to clear out the body and focus on healthy lifestyle. As you probably already know, I have started new programme called LiveLagom. House detox is ongoing, time for the body detox. My next step is to make sure I get the right nutrition’s and vitamins! 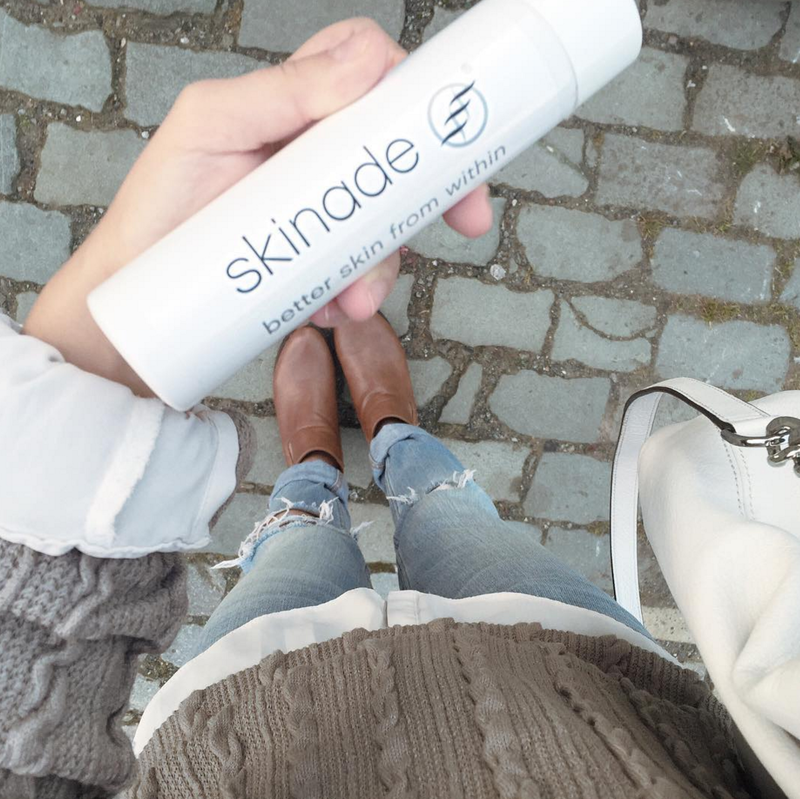 I was introduced to Skinade, a beauty drink back in summer. I was send a month trail of this product including travel size. It was just before I shut of to Gran Canaria for my holiday with my boyfriend. I had no clue yet, how this beauty drink could help me. You know, you read all the beauty products and you just not sure. These days, scam after scam we are tricked by all the ‘super revolutionary products’’ that help us look more beautiful. I tried many ‘Beauty tricks’ things, from wrapping myself in cling film to lose weight (I know gross) hand made beauty products, oil pulling, stripes teeth whitening, digital face brushes, diet tea’s that make you unsociable; oh you name it- I perhaps tried and tested! It’s time for me to start to sharing my opinions on all these! 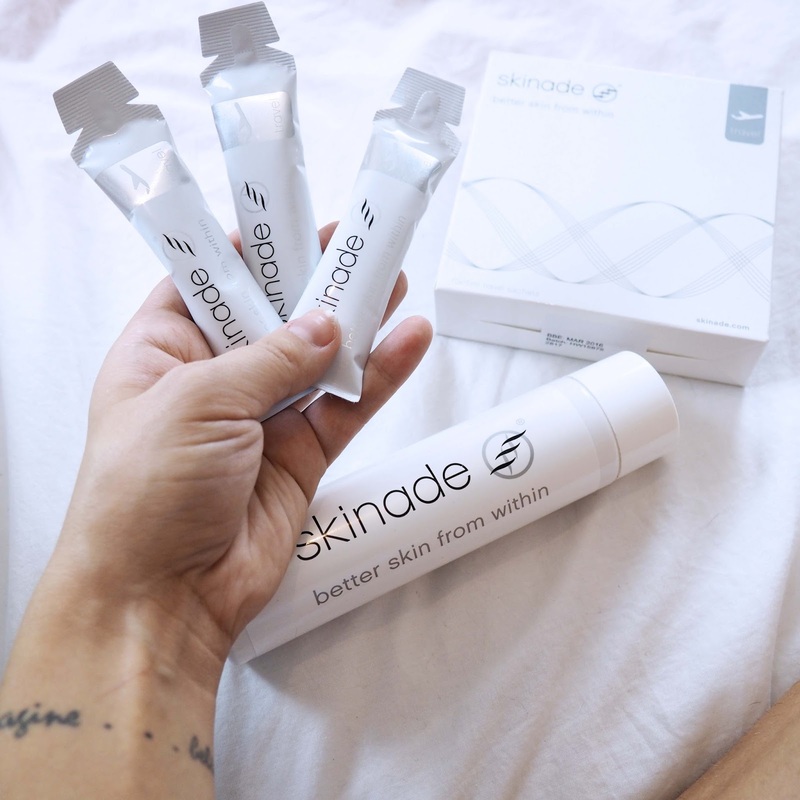 I’ll start with Skinade! This beauty drink contain main ingredient; a collagen, a Hydrolyzed Marine Collagen Peptides to be more specific. Beauty bloggers perhaps knows exactly what collagen is, but if you like me who need to know exactly what is where, and how it works, let me help you to explain it. Collagen is basically a protein in our bodies. The word is taken from a Greek ‘kolla’’ that really means a glue, which what collagen does, holds the body together and you can find it not only in your skin but also in muscles and bones. Collagen is the one that play huge part in dead skin replacement and with it healing and repair benefits. As we age, our body produce less collagen, therefore these days we can find many beauty products that contain collagen. 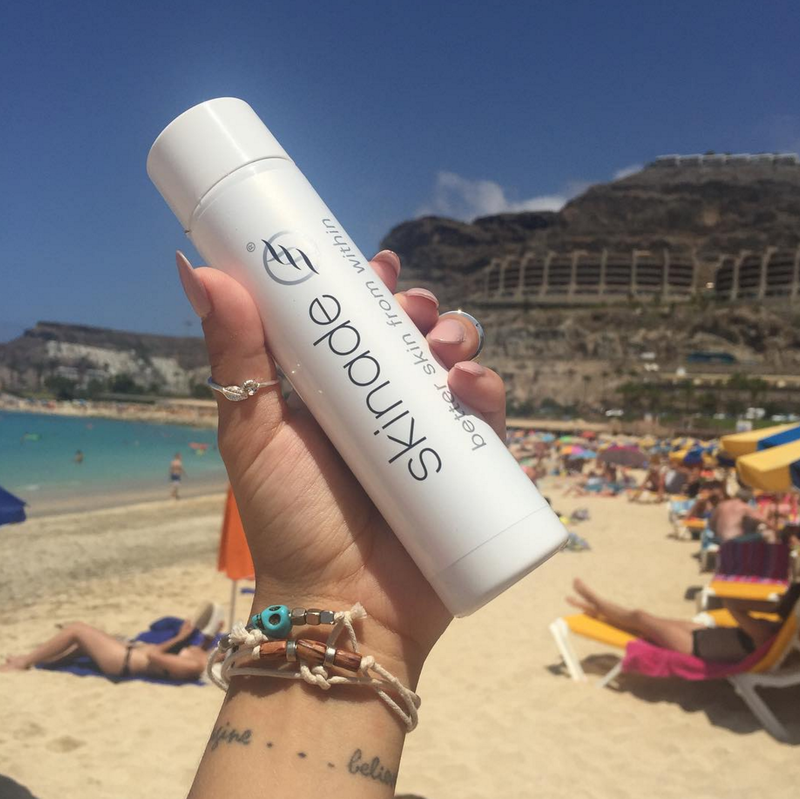 I started to drink Skinade around 2 weeks before my flight to Gran canaria. I loved the minimalistic package design, and I read all about it, yet I was still little sceptic. The taste is really nice! Very peachy, like peach squash that I love! I had made a little mistake of my first week while drinking skinade after breakfast. As soon as I got to work, I was having a coffee. This was approximately 20min after. You shouldn’t do it. Caffeine can hinder the absorption of the essential micro-nutrients and collagen, which means the drink is not strong enough or wont work. I am working crazy hours, and spend night blogging so I am always tired and lack energy plus I have the darkest and most horrible panda like circles under my eyes. I wouldn’t live without concealer! Also I can’t live without coffee, I am always too tired! I am like a zombie in the morning! My skin is not great either because of lack of sleep and lack of vitamins. It’s very dull and I need to add loads of foundation and bronzes to look alive! Once I stopped with my coffee, I started the next week properly. I also focused on well balanced diet at same time. I started a day with a porridge with fruits, then Skinade, after that some healthy snacks! I was doing really well for the entire week! I swapped coffee for a decaffeinated one. 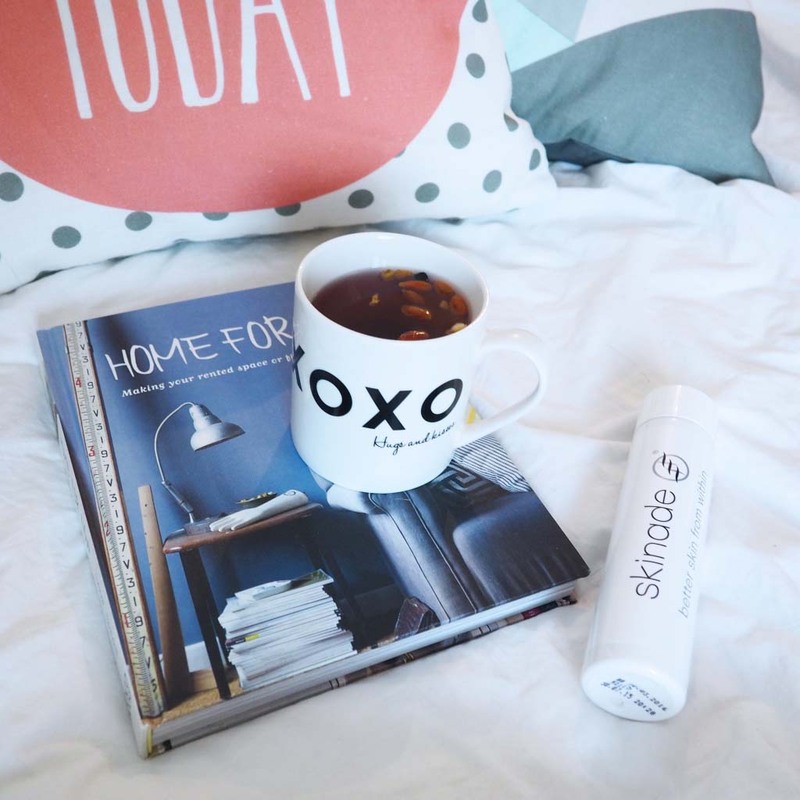 Skinade surprisingly was giving me already enough energy, I just needed the coffee for the taste! i do have to admit that I really was eating well for the entire week! It was a day before my holiday, I was packing my suitcase (yay) when I decided to check my skin properly. No, it wasn’t a wowzer in the mirror, but my spots cleared! My skin was still little dull but I honestly could see slight change, I wasn’t just sure what it was! Back to my Holiday. On first day, I had my morning travel size after breakfast. 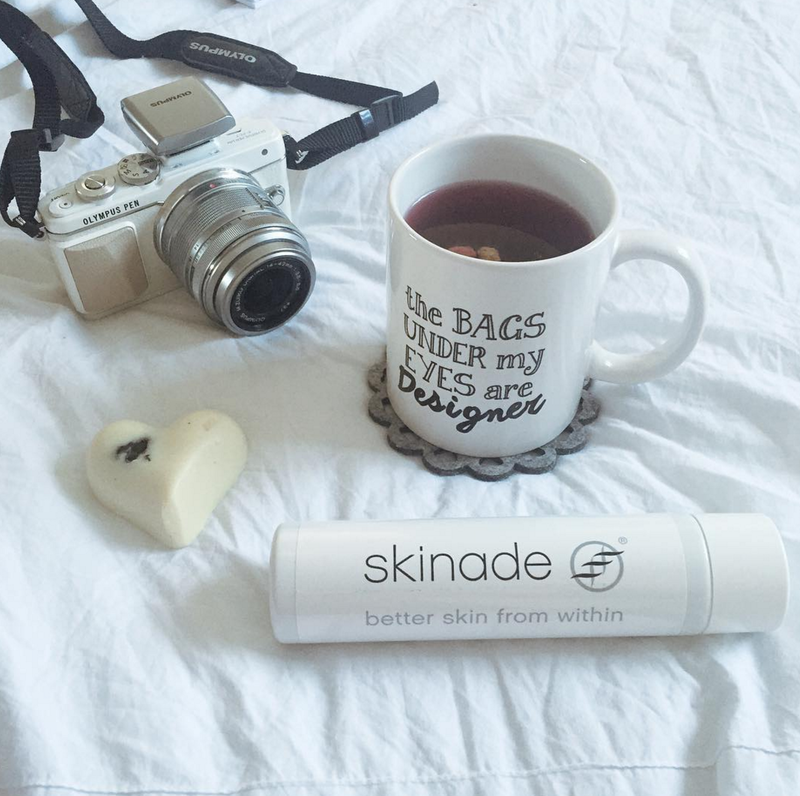 It was a concentrated version of skinade and I have used smaller cup so the taste was stronger than normal. I still really like it! Second, 3rd day I was developing my tan, and on the 4th day my boyfriend was admiring my tan and mentioned to me; You didn’t get your allergy! It was so true! I didn’t! It was quite a purpose for me! I always get one! The whole holiday passed on and no allergy! For a person who suffer from it badly, it was best what could happen to me. I still very much was careful using factor 50 sun creams and avoided sun in pick hours but there were still time were we went on excursions where I was in direct sun during pick hours. My skin after holiday was nice and clean. I usually get post-holiday spots- this time none! As above I didn’t get my usual allergy either, and I was super confident without make up on the beach! My skin got firmer and make up could hold longer. Wrinkles– I have few fine lines luckily as 32 year old I have no wrinkles yet so I couldn’t really comment on this. My energy level was high, I was working like crazy, and blogging even more and I could go longer without being tired! Unfortunately I couldn’t see results within my hair or nails. These probably because my hair are bleached and damaged and this would work on more natural than bleached white hair with pink toner 😉 I had gel nails as well during summer so neither could comment on that. I would honestly recommend skinade to anyone! After trying myself, I know it really really helps! 3 of you can win 1 set each of 30 Skinade! That’s a whole month Skinade to try! Please read terms’& conditions before taking part in then Giveaway! There are 3 sets of 30 days of Skinned as prize. One person can win one prize only. • Open to UK, USA & Europe residents only. I've serious lack of elasticity. I live in the desert. My biggest skin problem is dryness. Enlarged pores! Bit of a greasy skin really which is great for wrinkles but is prone to enlarged pores. I suffer with dry patches, especially around my forehead and nose. My biggest skin problems probably oiley skin, I get a few huge spots on my chin and jaw line, but I'd gift this to my mum . 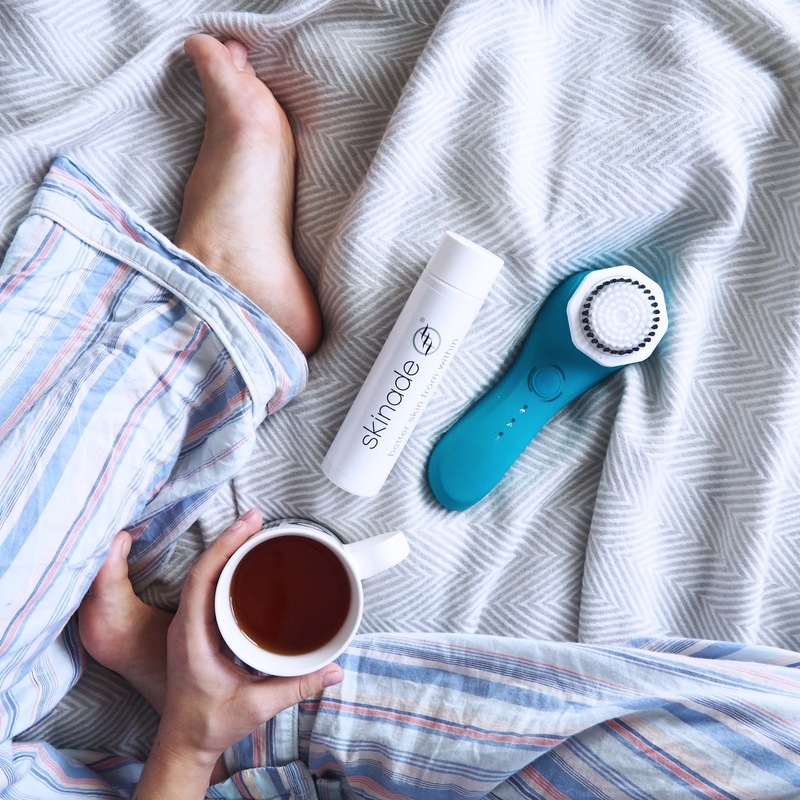 Combination skin – I have pores on my nose but dry cheeks and sometimes spots on my chin… I have it all going on! Dull skin and spots when I am stressed! I'm always quite skeptical of beauty products & I'd be extremely skeptical of a drink. I think natural drinks are definitely the way forward. It's good that this seemed to work for you. It does feel good to feel even better, especially when on holiday! sensitive skin – if I use certain products my skin breaks out! I get eczema on my forehead. Dull skin & my pores are getting bigger! I still get spots even though I'm too old for that!! Fine lines now not so fine!!! AKA wrinkles? My first thought was oh my I bet it tastes horrible, but I am glad you said it tasted lovely! I've never heard of a beauty drink before, but I have a feeling that these may be very popular this year!